A 2012 study published in the online journal, Investigative Ophthalmology & Visual Science, suggests coffee drinkers reconsider their coffee intake to decrease their probability of developing vision loss or blindness. The study’s research team observed that Scandinavian countries have the highest frequencies of glaucoma and exfoliation syndrome (a condition where abnormal material is produced and accumulates in the ocular tissues, which can lead to glaucoma). The team also noted that Scandinavians have the highest consumption of caffeinated coffee in the world. Previous research found that greater caffeinated coffee intake was associated with an increased risk of primary open-angle glaucoma (a gradual disease that can slowly lead to vision loss). With this new study, investigators sought to evaluate whether the risk of exfoliation glaucoma or glaucoma suspect (borderline glaucoma) may be different by coffee consumption. Researchers used surveys to acquire and verify the consumption of caffeinated beverages and analyzed medical records to find incident cases of exfoliation glaucoma (which encourages elevated pressure enough to damage the optic nerve) or presumed exfoliation glaucoma (that may have done slight damage to the optic nerve). 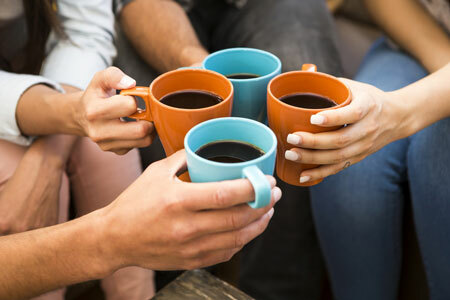 The study showed that compared with people who abstain from caffeinated coffee, participants who drank three or more cups daily were at an increased risk of developing glaucoma exfoliation or glaucoma suspect. Investigators did not find any correlations with consumption of other caffeinated products, such as tea, soda, chocolate or decaffeinated coffee. Researchers also found that women with a family history of glaucoma had an elevated risk. The bottom-line is that while the study showed an association between high levels of coffee intake and increased risk of developing glaucoma, it did not prove a cause-and-effect relationship. Still, medical professionals generally recommend drinking caffeinated beverages in moderation—not just to reduce your chances of glaucoma, but also for your overall health. Researchers from the Netherlands found that people with myopia (nearsightedness) have an approximately doubled risk of developing glaucoma as compared to those without myopia. The study, reported in Ophthalmology (2011;118 (10)1989-1994), attempted to clarify the relationship between myopia and glaucoma. High myopes (nearsighted people) had a 2.5x higher chance of developing glaucoma versus 1.75x for lower myopes. Glaucoma is one of the most common causes of blindness in the United States. What’s especially troubling is it is a “silent disease” in which there are no symptoms such as blurry vision or pain for patients to watch out for. Dr. Ashraf advises people at risk for glaucoma to have a yearly eye exam. This is especially important for post LASIK patients with high myopia since their eyes still behave as if they have high myopia, despite the patients being able to see perfectly. A 2011 study of 5.3 million men and women seen in the Department of Veterans Affairs outpatient clinics over a one-year period found that use of cocaine is predictive of open-angle glaucoma, the most common type of glaucoma. The results of this study, which were published in the September 2011 issue of the Journal of Glaucoma, revealed that current and former cocaine users had a 45 percent increased risk of glaucoma. Men with open-angle glaucoma also had significant exposures to amphetamines and marijuana. Investigators reported that patients with open-angle glaucoma and a history of exposure to illegal drugs were nearly 20 years younger than glaucoma patients without a drug exposure history (54 years old versus 73 years old). This study is significant since glaucoma is the second most common cause of blindness in the United States. Dr. Ashraf, medical director of the Atlanta Vision Institute, stresses that regular glaucoma screenings with an eye care professional are important, as there are no symptoms for the disease such as blurry vision, redness or pain until late in the disease process. By the time the patient notices changes in his or her vision, a substantial amount of peripheral vision will have been lost and cannot be reversed even with treatment.